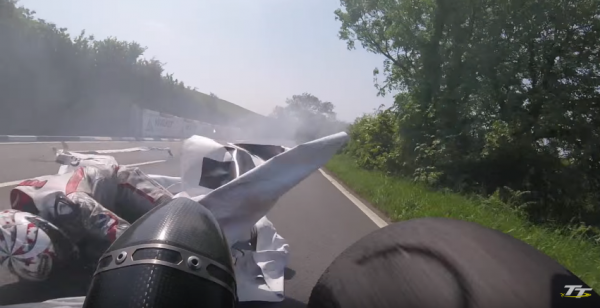 James Cowton comes off his bike in the RL360º Quantum Superstock TT and has reason to be thankful for the recticel crash barriers and Horst Saiger's very quick reactions. Dropping the bike at speed and piling into the barriers, Jamie picks up a sponsor banner as he is deflected back in to the road where he comes to a rest just as Saiger gets his ZX-10R slowed right down. Clipping the banner, Horst is able to carry on with his race (he finished 13th, a PB), knowing that Jamie is able to get up and walk away with just bumps and bruises - a real testament to the value of the crash barriers deployed at vulnerable points around the course.